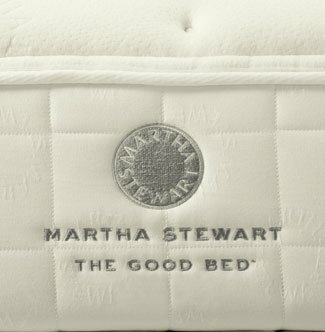 Today, Martha Stewart launches her mattress website to showcase her latest merchandising venture: The Good Bed. "Shopping for a new mattress can be complex and bewildering. To find a mattress that suited her comfort, style, and quality requirements, Martha decided to create her own. First she identified three distinct comfort levels—plush, medium-firm, and firm—with each level designed to provide essential support and a restful sleep. To achieve her classic style, Martha sourced the finest materials, including 100% cotton fabrics inspired by her personal collection of vintage tickings. Finally, she enlisted one of America's foremost mattress builders to ensure every mattress bearing her name is well made. 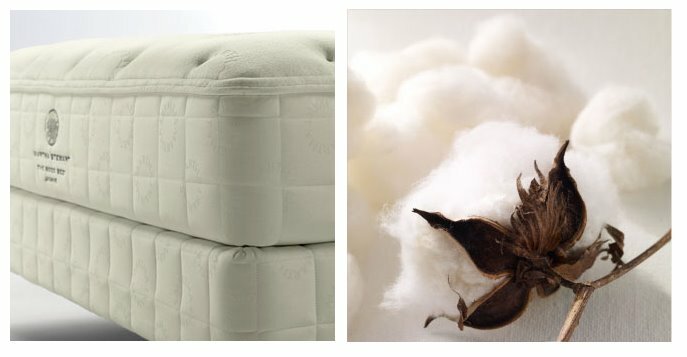 Each Good Bed is crafted with high quality, authentic materials such as New Zealand wool, 100% cotton fabrics, natural latex, soy-based foam, recycled steel, and Canadian spruce to ensure long lasting comfort. Many new mattresses are exceptionally thick, placing the mattress height too far from the floor and overwhelming the scale of the bedstead. Martha directed her team to design lower profile mattresses that are sensibly proportioned. And each Good Bed features continental tailoring, which creates a curved edge at the mattress base so that linens fit securely." Naturally, I go for the plush mattresses! I think they look beautiful and I can just imagine the comfort I'd experience on one of these. My two favourites are Jasmine and Meadowsweet. Jasmine is medium-firm and Meadowsweet is plush. I'm thrilled to see that Canadian spruce is among the well-chosen materials to be used in The Good Bed! I'm also very glad to see that they've used as many all-natural products as possible. 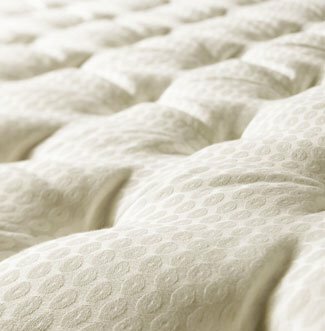 On the website, there is an indication of which mattresses use the most natural products in their design. Beauty, comfort and quality: you can't go wrong! And in other MSLO news: Martha Stewart Living Omnimedia, Inc. (NYSE: MSO) today announced that the company has named Patsy Pollack the Executive Vice President of Merchandising. In this newly created position, she will be responsible for overseeing the Martha Stewart Collection exclusively at Macy's and Martha Stewart Everyday at Kmart as well as MSLO's portfolio of home decorating programs, which includes the award-winning Martha Stewart Furniture with Bernhardt, Martha Stewart Rugs with Safavieh, Martha Stewart Lighting with Generation Brands, Martha Stewart Floor Designs with FLOR and Martha Stewart-created KB Homes. Ms. Pollack will report to President of Merchandising and Co-CEO Robin Marino. An accomplished retail executive with vast experience in the lifestyle designer category, Ms. Pollack joins MSLO from Donna Karan Home, where she has served as Chief Executive Officer since 1999. Great.. just what I need... a Martha Stewart mattress! Martha is just everywhere! You can have a Martha Stewart house with Martha Stewart furniture, painted in Martha Stewart colors, a Martha Stewart mattress on a Martha Stewart bed with Martha Stewart bedding, Martha Stewart towels in the bathroom (and shower curtains and bath accessories), Martha Stewart window coverings, Martha Stewart carpets and rugs, Martha Stewart lamps and lighting, Martha Stewart cookware and dishware and dish linens, and a Martha Stewart ham in the fridge. Martha Stewart toned appliances whip up the baking while Martha Stewart books rest on the Martha Stewart shelves and Martha Stewart magazines on the Martha Stewart coffee table. The sweetheart is out gardening with Martha Stewart gardening tools and planting Martha Stewart seeds while the kids play cards on the Martha Stewart patio furniture. Whew!! Now those are some pretty mattress'. But would you expect anything less from Martha?!?! the range of products mslo delivers is impressive. i belive there is no other company that sells you everything from the house to the matress. they should rename to martha stewart living onmipresence. I can see Kenn now in a Martha blue car!